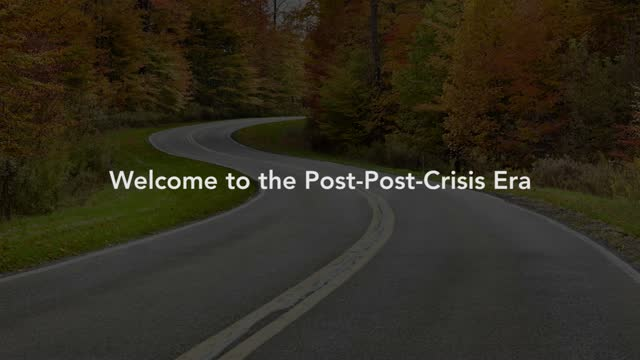 Mike Gitlin, Head of Fixed Income for Capital Group, explains why we’re in a “post-post-crisis era,” the term he uses to characterise today’s global economy. Capital Group is one of the world’s largest independent investment managers. Since 1931, our aim has always been to deliver superior, consistent results for long-term investors. Investment management is our only business. Our video and webcast channel enables UK and European professional investors to hear the latest views from our Portfolio Managers and Investment Specialists on the current investment landscape and stay up-to-date with our fund range. Simply analysing companies on the basis of where they’re located is arguably becoming less relevant in today’s markets. Investment Director Julie Dickson describes how Capital Group’s fundamental research-based approach looks beyond traditional boundaries, which helps our investment professionals identify the emerging multinationals of the future as well as those existing multinationals that are well positioned to benefit from secular growth trends and changing global trade patterns. Please join Capital Group for a live webcast discussion with Julie Dickson, who will share her insights on a rapidly changing world. She will discuss how the business landscape is being reshaped, and how future-proofing your investment portfolio requires a new perspective. The pace of change for global investors has never been more rapid. With changing international trade patterns, it’s challenging to stay alert to the opportunities that are arising. At Capital Group, we believe a research-driven approach is key to identifying the winners of tomorrow. In this video, some of our emerging market-focused portfolio managers discuss their outlook on the region and its growing importance in the years to come. In this video, some of our emerging market-focused portfolio managers discuss how emerging markets should be an important part of a long-term investor’s portfolio. In this video, some of our emerging market-focused portfolio managers discuss how emerging markets have evolved over time to become one of the most dynamic areas of global investing. Emerging markets comprise a vast and diverse set of opportunities. In this video, some of our EM-focused portfolio managers underline the importance of deep research and how it can help unearth these opportunities. Thirty years ago, the World Bank invited Capital Group to create the world’s first emerging market equity fund. In this video, some of our EM-focused portfolio managers remember the early days and the challenges associated with investing in the region. In this webcast, Richard Carlyle, investment director at Capital Group, assesses the diverse EM universe, which spans more than 60 countries at different stages of maturity. He also described how an active, research-intensive approach to investing across the entire traded EM universe offers the potential to deliver equity-like returns with lower volatility than emerging market equities. Matt Miller, policy and communications advisor for Capital Group, discusses the challenges that lie ahead for President-elect Donald Trump in negotiating trade agreements with China and Mexico. In this video, Portfolio Manager Luis Freitas De Oliveira discusses how Capital Group’s Emerging Markets Total Opportunities strategy offers a potentially lower volatility route into emerging market investing, and the different ways the strategy can fit into client portfolios. Matt Miller, policy and communications advisor for Capital Group, discusses what investors might expect from the shifting political landscape in Washington after Donald Trump’s surprise presidential win. In this video, Capital Group portfolio manager Seung Kwak discusses our core, all-cap approach to Japan equities investing. Investment Director Richard Carlyle reviews the quarterly results, key drivers, portfolio positioning and outlook of the Capital Group Emerging Markets Total Opportunities (LUX). Investment Director Richard Carlyle reviews the quarterly results, key drivers, portfolio positioning and outlook of the Capital Group New Perspective Fund (LUX). I professionisti dell’investimento di Capital Group parlano delle imminenti elezioni negli USA e di cosa potrebbero significare per l’economia statunitense, la politica pubblica e gli investimenti. Investmentspezialisten der Capital Group im Gespräch über die bevorstehenden Präsidentschaftswahlen und ihre möglichen Folgen für die US-Wirtschaft und -Politik ¬− und für Anlagen in den USA. Profesionales de la inversión de Capital Group nos hablan sobre las próximas elecciones estadounidenses y sus posibles consecuencias sobre la economía nacional, la política pública y las inversiones. Capital Group investment professionals discuss the upcoming US election and what the outcome may mean for the US economy, public policy and investments. In this video, Capital Group portfolio manager Nick Grace introduces the New World strategy. He discusses how the strategy differs from a traditional emerging market equity approach, portfolio construction and the opportunities that the strategy seeks to benefit from.